What would you do if you had a hundred sheep and suddenly lost one? Would you write it off as a small loss or would you leave your ninety-nine safe sheep to go in search of the one who is lost? Jesus tells this parable and it should cause us to ask some questions ourselves about who is lost, what it means to be found, and what we can do to take up the search. In Matthew 19 a rich young man asks Jesus what he must do to get eternal life. What he's not asking Jesus is what he needs to do to go to heaven a live forever. Rather the man is asking Jesus what it takes to have a life that is eternally depth with meaning. What he's essentially asking Jesus is how he can tell a better story with his life. As we wrap up our One series we take a look at the final clause, there is "one God and Father of all, who is over all and in all and through all." How is this one God over, in and through all? Who is the "all" Paul is talking about? Just how expansive is this idea that God is over, in and through all? Some Christians believe in infant baptism while others believe in adult or believer baptism. Some Christians baptize by submerging the person in water, while others baptize by sprinkling water over the head of the person. 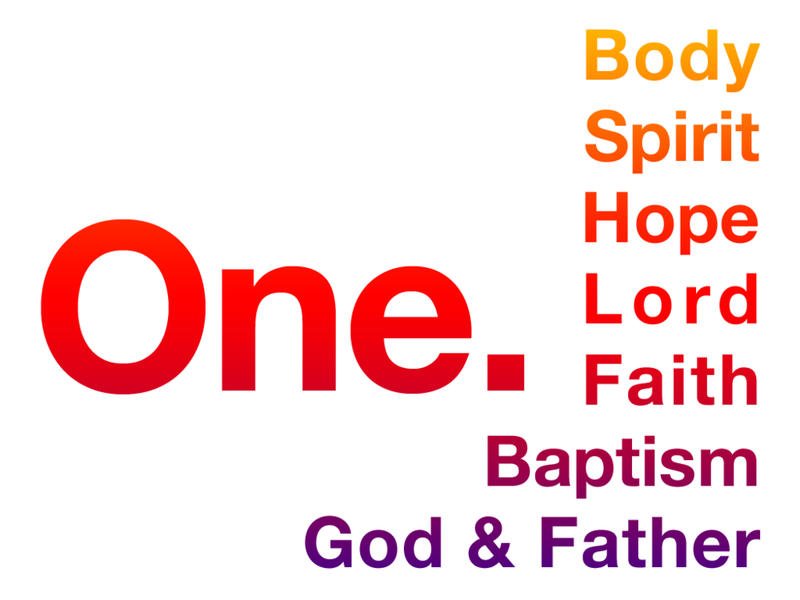 With so much diversity in methods, how can Paul say we all participate in one baptism? Probably Paul's most audacious claim is that there is one faith. How can you say that when there are literally thousands of Christian denominations, many of whom believe competing theologies? This week we discuss the difference between essential and non-essential theology, looking at what areas all Christians need to agree and where we can have a little more diversity. A common refrain in the Roman Empire was "Caesar is Lord", a belief that Caesar was a divine being appointed by God to bring peace to the world. A peace that was often brought about through violence. However, the first followers of Jesus insisted that Jesus, not Caesar, was Lord. This had major ramifications for how the understand peace, violence and who was ultimately in charge of the world. What does it mean to put our hope in Jesus? Is our ultimate hope that God will eventually rescue us from a corrupt world just before destroying it with fire? Or is our hope found in the idea that Jesus can redeem and restore even the darkest situations of this world? Furthermore, what does it mean to be called to join Jesus in the process of redeeming and restoring this world? All Christians are part of the Body of Christ but we don't all look or act the same. That's because some of us are hands while others are feet, eyes, ears or mouths. What part of the body are you? What kinds of gifts, talents and resources has God given you and how might he want to use you in order to build up the rest of the body for service to the world around us? We start off our One series on Pentecost Sunday talking about the one Spirit that lives inside all Christians throughout all time. What is the role of the Spirit in our lives? Can we trust the Spirit of God to work in other Christians in the same way it has already started to work in our own lives? What would that level of trust look like in our lives?